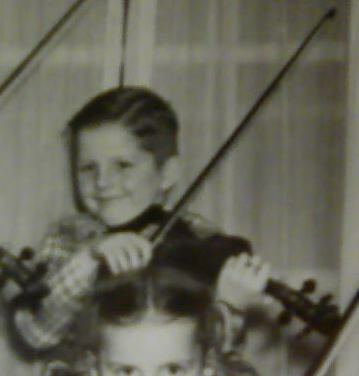 Over 35 years ago I started learning the violin. I was in my mid to late twenties so I was a late starter though I had a lot of experience with other instruments and in reading music. I found a professor at a nearby college who gave classical violin lessons. I went once a week for one hour each time. The cost was 5 dollars. Back then I had to order the music I needed from Schirmer publications. I remember there was one piece by Seitz. It was the Student Concerto no. 3. I had absolutely no idea what it was supposed to sound like, and in those days the only way to hear it was to find a vinyl record of it somewhere. Naturally it would be difficult to find here in KY. So I was approaching it blind so to speak. When lesson time came I had no choice but to drive almost 30 miles one way to get one. My teacher was the ONLY input I had on violin. There was no internet then. For one reason or another, mostly lack of time to practice seriously, I stopped playing the violin. I'd play a tune here and there but there was no more learning. Now I've started back. I have all my music on my laptop computer, all of it downloaded free from the internet. I downloaded the Seitz concerto (it will be A LONG WHILE before I tackle that one again). Today, instead of trying to learn it blind I can find performances of it on YouTube. I found several of little 5 year old girls playing it, and playing it VERY well. Today if I need tips on things like vibrato I no longer have to wait for my next lesson. I can find many tips on playing on sites like Fiddlerman's great site. I can hear and see how to do things from the privacy of my bedroom. Today, instead of having to drive 125 miles one way (the distance to the nearest violin teacher I can find) I can use Skype and get lessons from Pierre. Imagine that! Lessons from a longtime professional. Without the internet and Skype and Pierre I'd just be out of luck. With all these pluses I think today is the best time to study violin again, especially for senior citizens like myself. All I have to supply is determination and practice. Everything else can be had in the comfort of my bedroom. To me that is absolutely amazing. Fiddlerman has an amazing site here. I hope to be a part of it for a long time to come! Great points Dave. I remember the difference too. Have you taken up Seitz concerto no 3 again? I remember entering a concerto competition for all county with that concerto and won when I was a kid. The problem was that the teachers (judges) decided that they could not find the orchestra parts for that concerto and didn't award the concerto to me. My teacher got furious and claimed that there were orchestra parts available but told them that I could play any concerto they wanted me to play if they didn't want Seitz. I ended up playing Mozart concerto no 3 with the honors orchestra instead. I still to this day don't know if anyone plays that concerto with an orchestra. I haven't started it yet. It will be a while before I'm confident enough. Right now it's mostly scales and Wolfhart exercises. My intonation is off just enough to drive me nuts. I have a long way to go. I found probably half a dozen performances of it on YouTube. They were all with piano accompaniment. If it's done with an orchestra I didn't find any examples. It really humbled me to see those little kids playing the devil out of it! Sounds like you got a raw deal at that competition but things sure turned out great for you. Odds are that most of the other competitors are still amateurs, if they play much at all anymore. I couldn't find it with orchestra either, but this little boy sure does impress me. He impresses me too! I saw one YouTube video of a little girl, probably 4 years old, playing it. She was good too. Back on the point of the original post.. Yes, these days there are a lot more resources easily available for learning music or just about anything. It is great. I remember back around when you first started, how sometimes one would have to go to the music store and, if they didn't happen to have the score you wanted, order it and wait sometimes for weeks for it to come in. Video tutorials didn't exist yet, and even getting audio tutorials was pretty rare in many kinds of music. But remember that when you have put as much work and as many hours into a piece as they have, there may still be a difference in how well you can play it from how well they can play it.. But it will be considerably less. Overall, though? Yup, I think it is a better time to learn music than some other times. So much help and resources are available now.